In early June, math teachers from several East Alabama school districts gathered at the AMSTI-AU site in Opelika for a Professional Mathematics Learning Communities project. Dr. Marilyn Strutchens, McFraley Professor in the Department of Curriculum and Teaching in Auburn’s College of Education, and Elizabeth Hickman, the AMSTI-AU director, were co-directors of the project and served as presenters during the summer academy. Other presenters included Dr. W. Gary Martin, Leischuck Endowed Professor, and Megan Burton, Assistant Professor (both from the Department of Curriculum and Teaching); Pamela Norris, Assistant Director of AMSTI-AU, and Lisa Ross, Project Manager (TEAM-Math). Presenters from Auburn’s College of Science and Mathematics included Professor Ulrich Albrecht, Steven Stuckwisch, Assistant Professor Emeritus, Narendra Govil, Alumni Professor, and Huajun Huang, Associate Professor. Transforming East Alabama Mathematics (TEAM-Math) is a National Science Foundation-funded Math and Science Partnership between Auburn University, Tuskegee University, and 14 school districts in East Alabama. 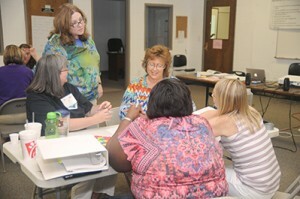 TEAM-Math provides professional development for K–12 mathematics teachers. The Alabama Math, Science, and Technology Initiative, commonly referred to as AMSTI, is the Alabama Department of Education’s initiative to improve math and science education across the state. AMSTI is considered by many to be the largest, most comprehensive and most successful math and science initiative in the nation. TEAM-Math and AMSTI joined forces to develop and present the project. The project’s aim was to establish professional learning communities and provide collaborative and sustained professional development for teachers in targeted K-12 schools. 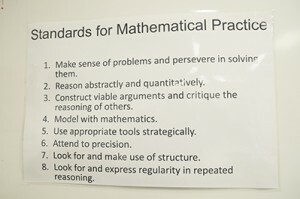 The immediate focus of the professional development was the Alabama College and Career Ready Standards (ACCRS), especially the Standards of Mathematical Practice. 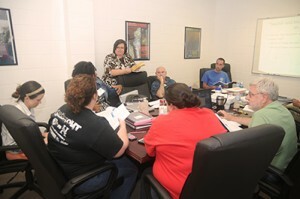 The project had multiple goals, including: 1) to establish a triad leadership team of mathematics educators, mathematicians, and AMSTI specialists to provide professional development for facilitating Professional Learning Communities (PLCs), monitoring school and across-district PLC development, and helping the school systems move toward sustaining the PLCs; 2) to provide professional development for administrators to help them become knowledgeable of issues related to mathematics instruction and versed in the dimensions related to successful PLCs; 3) to provide grade level leaders with professional development related to the ACCRS-M, facilitating PLCs, and student data analysis; 4) to provide teachers with professional development related to the ACCRS-M, participating in PLCs, and pedagogical analysis; and 5) to improve student outcomes through the work of the PLCs. Strutchens described these school partners as “super engaged and highly motivated.” In addition to exploring teaching methodologies and formative assessments, the teachers engaged in open discussions of the various ways students learn and how best to reach students. Teachers talked about using cooperative groups, allowing students to engage in productive struggle, and helping students develop both critical reasoning skills and mathematical fluency.